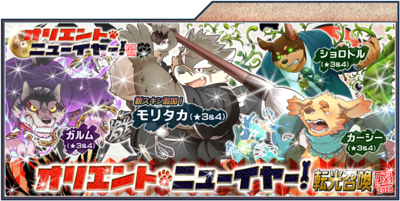 During this event period, a limited-time event quest "Oriental New Year", which will unlock a limited-time, but repeatable, event free quest, which yields the item of the month: Money Offerings for the Year of the Dog. As normal now, there's a chart of skills that'll boost the drop quantities of Money Offerings for the Year of the Dog. In short, any dog or dog-like character receives a bonus in some way. There's also art of this handsome devil. Additionally, logging in during this event period will give you a New Years Frame for your My Guild. 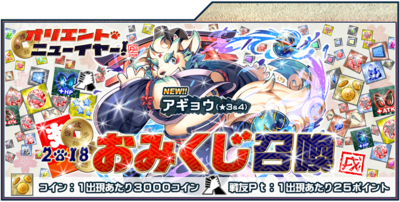 Additionally, you can consume Money Offerings for the Year of the Dog for a chance to summon a new unit, Agyou, or other items. At the bottom of the banner, you can receive 3000 coins and/or 25 Ally Point per occurance. More details and less confusion will be published when known. 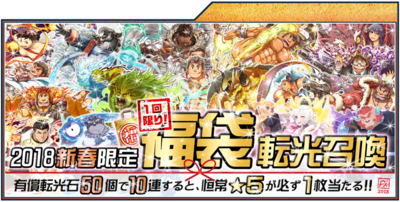 This gacha is only available for 4 days (beginning of Jan 1st to end of Jan 3rd). In it, you're guaranteed only one (1) ☆5 unit. Already having 5 stones, buying a 30 + 15 pack is "NG" (no good). Buying a flat 50 + 32 pack will work. As a reminder, you can view your free/paid stone count in Settings > Item. From here, you'll see 転光石（無償） and 転光石. The one with 無償 is your free stone count, while the one without is your paid stone count. There's also a third gacha containing no new characters, only those that appear throughout this event. Completion unlocks Free Quest from Introductory to Advanced. This page was last edited on 14 July 2018, at 21:31.